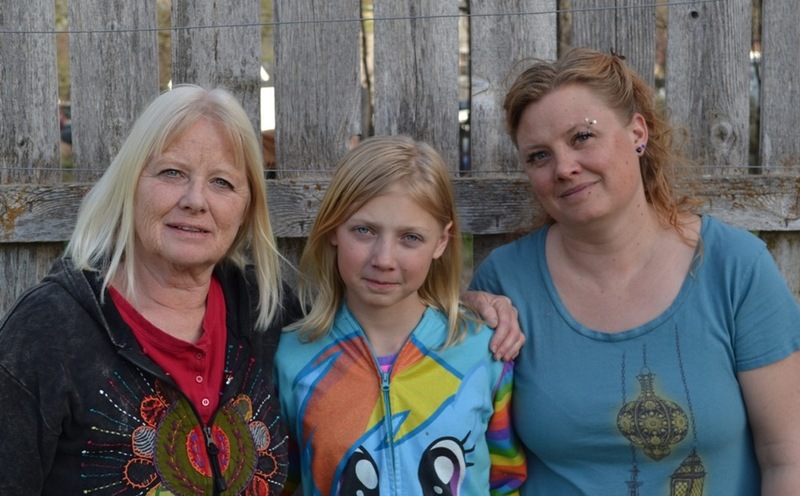 Peggy Tibbetts (left), her daughter, Ema (right), and 12-year-old granddaughter, Hailey, all of Silt, say the area's oil and gas industry is to blame for toxic chemicals found in their blood and urine. A Roaring Fork Valley doctor has recently conducted blood and urine tests on a family in Silt who claim to have been made sick by nearby oil and gas activities. Dr. John Hughes, of the Aspen Integrative Medicine group, who conducted the tests on the Silt family, also said that testing is to be expanded and that he is seeking volunteers from among those living near natural-gas facilities in western Garfield County. Hughes is teaming up with a research program with the University of Oklahoma to conduct blood tests on people living near oil- and gas-extraction facilities. He’s planning to facilitate a study headed by researcher Dr. Jay S. Hanas, of the school’s Department of Biochemistry and Molecular Biology. In addition to testing the Tibbetts family in Silt, Hughes has conducted similar tests on people in Carbondale and the Front Range oil-and-gas-boom town of Erie looking for signs of contamination from industry activities. He said his results from 11 Erie residents had revealed “high levels of ethylbenzene,” a volatile organic compound typically associated with gas-drilling activities. No such substances were detected in the Carbondale subjects, Hughes reported. Petty Tibbetts, whose blog “From the Styx” is a conduit of information about oil and gas activities for many residents of western Garfield County, recently issued a call for volunteers who live in the “drilling impacted area from Silt to Rifle to Parachute/Battlement Mesa” and who have experienced health problems including respiratory infections, swollen glands, earaches, headaches, nosebleeds, asthma, rashes and other maladies. Tibbetts indicated there is a need for 20 volunteers and that the testing is likely to be carried out in Silt. Hughes said he will be the “data collector” for the study but will not be in charge of the testing program or of reporting its outcomes. The oil-and-gas industry has long disputed claims that its activities make its residential neighbors sick, pointing to a lack of documentary proof of any such illnesses among those living near gas-drilling facilities. And in Garfield County, air-quality-monitoring programs detected no violations of federal air-quality standards in 2013 other than “a slight increase in the amount of benzene detected in the air” compared with previous years, according to an April 21 article in the Glenwood Springs Post Independent. Still, the Colorado Health Department in February issued new rules for statewide regulation of air pollution by the oil-and-gas industry, and an array of those living near the industry’s wells and other facilities continue to maintain that their air is being fouled by industry activities. And in Texas, a jury recently awarded nearly $3 million to a family in Decatur, Texas, about 60 miles northwest of Dallas, over the family’s claims that nearby natural-gas extraction activities were making them sick. Tibbetts along with her daughter, Ema, and 12-year-old granddaughter, Hailey, had their blood and urine tested in early April by a nurse working for Hughes. The testing was done at the family’s expense, Tibbetts noted, saying it was an expensive process undertaken only after the family started showing symptoms that included upper respiratory infections, swollen glands, sore throat, congestion, coughing, sneezing, earaches, shortness of breath and itchy, watery, burning eyes. The results of those tests have indicated that the family has been contaminated by what are known as volatile organic compounds, substances that are commonly associated with oil- and gas-extraction activities, according to data made available to Aspen Journalism by Hughes’ office. The samples were sent for analysis to a lab at Colorado State University, which detected the presence of volatile organic compounds — ethylbenzene and zylene — in the blood samples, Hughes reported. The lab also detected metabolites — chemicals left over by the human body’s metabolic processes — of several volatile organic compounds in the urine samples. The metabolites, according to the results sent to Hughes, indicated that the patients had been exposed to benzene, toluene, ethylbenzene and xylene, which together make up the BTEX group of volatile organic compounds, which often are associated with natural-gas activities and some of which are known to cause illness in humans. Studies have concluded that exposure to certain BTEX compounds can result in skin and sensory irritation, depression of the central nervous system and effects on the respiratory system. Prolonged exposure to these compounds, researchers say, also can harm the kidney, liver and blood systems. According to the Environmental Protection Agency, there is sufficient evidence from both human epidemiological and animal studies that benzene is a human carcinogen. Workers exposed to high levels of benzene in occupational settings were found to have an increase in leukemia. Tibbetts, who is an active skeptic and critic of the oil-and-gas industry, noted that she and others have long complained of ill health effects stemming from their proximity to natural-gas facilities. Tibbetts sent her test results to the Garfield County Department of Public Health in the hope that the county might help her learn more about the matter. Tibbetts’ family is not the first to publicly accuse the oil-and-gas industry of poisoning their household. The family of Bill and Beth Strudley, who formerly lived on Silt Mesa, in 2010 began becoming ill, experiencing nosebleeds, skin rashes and other ailments. They blamed their health problems on nearby natural-gas-drilling activity and have filed a lawsuit against the Antero Resources energy company that currently is before the Colorado Supreme Court. According to numerous media reports, a Dallas County jury on April 22 ordered the Aurba Petroleum company to pay the family of Bob and Lisa Parr, who with their daughter, Emma Duval, live on a 40-acre ranch near Decatur that is surrounded by gas wells on other people’s property. The family reportedly had been suffering a variety of illnesses starting in 2008 but did not file the lawsuit until 2011. She told the program that she went to eight different doctors who could not figure out the source of her health problems. It was not until Bob Parr talked with a scientist conducting air sampling on a neighbor’s property that they began suspecting they were being poisoned by fumes coming from approximately 20 drilling rigs that surrounded their home, Lisa Parr told NPR. Industry representatives have maintained that the facts of the case, which was filed as a “nuisance” suit under specific state laws, did not warrant the award, and Aruba Petroleum is likely to appeal. According to the Law360 website, industry legal experts are worried that, even if the jury’s award is overturned on appeal, the jury’s findings could “give encouragement to plaintiffs considering bringing suit” over similar circumstances as those in Decatur. Editor’s note: Aspen Journalism collaborated with The Aspen Times on this story. The Times ran a version of the story on Sunday, May 4, 2014.